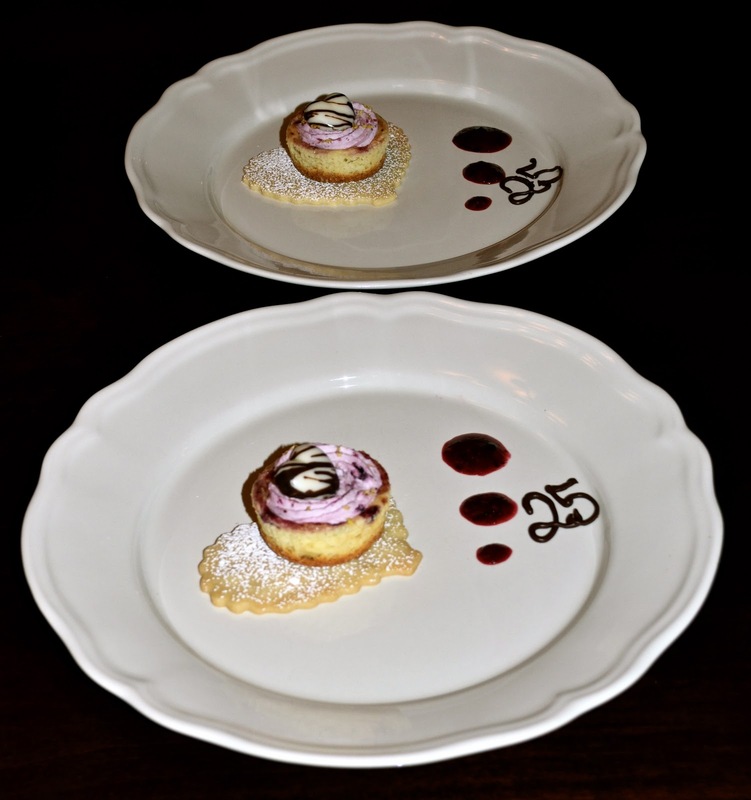 Happy 25th Anniversary to my parents: Berry cheesecake with lemon-berry whipped cream, lemon zest, and a chocolate heart on a heart shortbread cookie with a berry sauce along with a chocolate 25. January 2ed was my parent's 25th anniversary. While they were at work and dinner, I whipped this dessert up and surprised them with it under a candlelight when they got home. I'm not really sure how I came up with it all. When I started the cheesecakes, I can honestly say I had absolutely no idea how I was going to plate them. But, I remembered the rolled out short dough in the freezer and I found a small amount of candy chocolate in the fridge, from there, my ideas spiraled. Cheesecake has always been a tough one for me, mostly because of the way it cracks. However, I recently learned that the reason why it cracked is because it was being over-baked. So, this time around, I baked it for the perfect amount of time and the recipe I used from annies-eats (with some of my own adjustments) came out amazing. The main part I switched up was instead of fresh raspberries, I used frozen mixed berries (strawberries, blueberries, blackberries, raspberries). Then, I topped my cheesecakes with a lemon-berry whipped cream and lemon zest. sugar (to taste), about 1-2 tbsp. depending on how sweet you like it. 2. Use a food processor to grind graham crackers, oats, and sugar together. 3. Add melted butter and process until the mixture comes together. Add more butter if needed but do not add too much. The consistency of the crust should come together but, should not be wet. 4. Press 1 tbsp. of crust into a pan lined with cupcake cups. Use a spoon or a shot glass to press down completely. 5. Bake crust in the oven for about 5 minutes. 6. For the filling, beat cream cheese on medium high speed in a mixer fitted with a paddle until whipped and creamy, about 3 minutes, scraping the sides often. 7. Turn the mixer to low and slowly add the sugar and salt. Beat a minute longer. 8. While on low speed, mix in vanilla extract and egg until fully incorporated and smooth, scraping the sides often. 9. Fill cupcake cups with 3 tbsp. of cheesecake batter each. 10. Defrost the frozen berries in a saucepan. (This will also get the juices out of the fruit to make more sauce than fresh berries). 11. Once thawed completely, place berries into a food processor or blender and puree with sugar. Taste the sauce and add more sugar if needed. 12. Using 1/2 tsp. of the sauce, dot each cheesecake 3 times. 13. Swirl the sauce, just slightly, with a toothpick or skewer. 14. Bake at 325 degrees for about 20 minutes or until the center hardly jiggles when the pan is shaken. Do not over bake or they will crack! Also, after they are taken out of the oven, they will sink in the middle, which is normal. 1. In the bowl of a mixer fitted with a whisk attachment, whip cream, confectioners sugar, and vanilla. to a stiff peak. 2. Fold in berry sauce puree to taste. 3. Add lemon zest to taste, but take care not to make the lemon flavor come out too much. You want the star of this dessert to be the berries, the lemon zest is present to accent the berry flavor. 4. Frost with a 1M Wilton star tip from the middle to the outside, only in the sunken part of the cheesecake. 5. Sprinkle some lemon zest over the finished cream. On top of the cheesecakes, being that it was their anniversary, I also used candy chocolate and heart molds to make heart chocolate. I started by filling the mold with plain dark chocolate. Then, I tried and succeeded at a drizzled white chocolate heart. I did this by simply using a spoon to drizzle the empty heart mold with dark chocolate, and then proceeded to fill the remainder of the mold completely with white chocolate. This was the first time I've ever done chocolate molds and I was a little worried about how I was going to remove them. I put the mold in the freezer for 10 minutes and when i removed it, I set it on top of a damp towel, turned it over, and gently pressed the backs of the hearts and they came out perfectly! After the chocolates were molded, I baked off a heart shaped shortbread cookie, dusted it with powdered sugar, removed the baked, cooled, and refrigerated cheesecake from the liner, and placed it on the cookie, along with the chocolate heart to garnish. Then, I dotted some of the leftover berry sauce onto the plate, melted some chocolate, and piped 25 on the plate. Being that I planned this dessert as I was making it, I'm pretty proud of how it came out. Not to mention, my parents adored it.